P.E.I. 's Official Opposition came out swinging on the first day of the fall sitting of the legislature, repeatedly questioning the premier about repercussions for provincial civil servants identified as having broken rules and contravening legislation with regards to the province's e-gaming affair. The government lost more than $1.5 million after a plan to make P.E.I. a regulator for internet gaming collapsed in 2012. E-gaming has been a common topic of criticism from the Opposition, but this was the first opportunity for MLAs to field questions based on findings from Auditor General Jane MacAdam's highly critical report. "Secret loans. Sweetheart insider deals. Conflicts of interest. And destruction of documents," said Opposition leader Jamie Fox, providing his own synopsis of the auditor general's findings. "How do you expect Islanders to not be cynical when they see no consequences for these reckless actions by senior government officials?" "Those public servants have not done anything wrong, notwithstanding allegations to the contrary," replied Premier Wade MacLauchlan. "And it is not the practice of our government ... nor my practice as premier to throw public servants under the bus." MacAdam's report on her special investigation of e-gaming in early October concluded government's pursuit of the plan "demonstrated a lack of due regard for transparency and accountability." During a presentation to the province's Standing Committee on Public Accounts, Green Party leader Peter Bevan-Baker asked MacAdam to name anyone still with government, "who knowingly violated the Financial Administration Act," with regards to approving the loan used to finance e-gaming. MacAdam provided the names of three senior civil servants who were on the board of one of the province's Crown lending agencies at the time. But it was former finance minister Wes Sheridan who was ultimately responsible for what took place, MacLauchlan said Tuesday, adding the three bureaucrats in question advised against the actions the auditor general has said were in violation of the Financial Administration Act as well as against Treasury Board rules. "These people gave advice ... it was or wasn't followed. But ultimately they gave professional advice. And I think that's what you have to defend and encourage and recognize," MacLauchlan said. MacLauchlan pointed to the whistleblower policy his government brought in, which he said will be strengthened during this session on the advice of the auditor general. "We're encouraging people to speak up, and I think that's much more important. In fact it would achieve just the opposite if I come in as premier and start suspending ... public servants for actions where they gave advice five years ago, and it may not have been followed." What about those deleted emails? 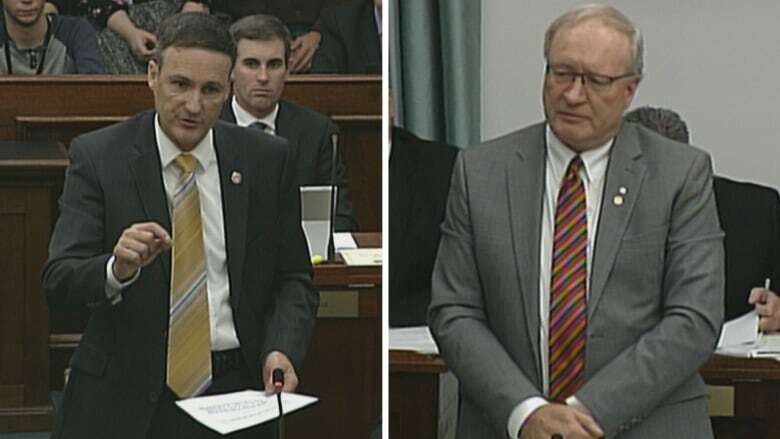 During Question Period Tuesday the Opposition also asked about emails the auditor general said were deleted, text messages she asked for which were never provided and a tussle over documents between the auditor general and P.E.I. 's superintendent of securities, who answers to MacLauchlan who is also Minister of Justice. These amounted to a breach of the province's Audit Act, claimed Opposition MLA Brad Trivers, which requires all government agencies to provide the auditor general with any information requested. "Why did you allow the Audit Act to be breached, and indeed obstruct the role of the auditor general in her investigation?" he asked MacLauchlan. Government co-operated with the auditor general, MacLauchlan said. On the issue of the deleted emails, MacLauchlan said two former senior civil servants had their email accounts deleted after leaving government. "That will not happen again," he said. "That will not be possible for a civil servant at any level who's departing to delete his or her email account."